First Night Monterey - Celebrating Art & Community for 27 Years! SIGN UP NOW FOR SUMMER DAY CAMP! 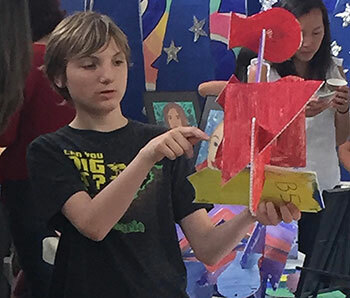 Children of all ages love the chance to be creative, and First Night Monterey's Summer Day Camps use arts as a catalyst to nurture creativity and enhance skills in a non-competitive, safe, fun environment. No prior experience or talent needed. There is a lot of fun and learning with age-appropriate mentoring as your children create in a real studio environment and have the opportunity to paint, draw and make with a variety of materials. Each Friday features an "open studio" exhibit of the work completed during the camp week. 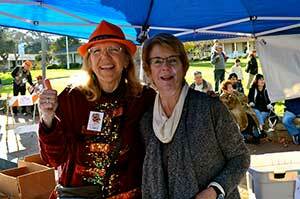 It would not be possible to present First Night Monterey without the support of hundreds of volunteers. First Night volunteers included teens, military personnel, retirees, service organizations and community members just like you! Volunteering with First Night is a great way for youth to fulfill their community service hours; artful activities are ongoing throughout the year. Read in their own words, why and how volunteers work the biggest end-of-the-year party in town! ABOUT KIDS' NIGHT OUT AT FMN 2019! The most creative New Year's Eve for your family! 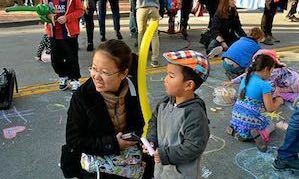 First Night Monterey and Kids' Night Out kicked off at 3 PM with the Opening Ceremony at Colton Lawn on Pacific Street; Kids' Night Out culminated with the 5:30 PM Twilight Procession serving as the Finale. Music, song, drumming, dance, ballet, folk dancing in traditional costumes, face art, art creating, hat making and more completed your artful time! ABOUT FIRST NIGHT MONTEREY 2019! Event goers "Buttoned-up" for 9 hours of entertainment! From Classical to Jazz, Blues to Rock, Samba to Folk! First Night Monterey 2019 had a line-up of over 65 performances designed to delight the entire family. World dance! International costumed dancers, including Chinese Lion dancers. Dancing to the sounds of country-western, oldies, rock-n-roll and tropical beats. Monterey Center for Spiritual Living: This beautiful Sanctuary resounded with mellow sounds, beautiful voices and great arrangements throughout the night! Multiple Venues throughout Downtown including the beautifully remodeled Conference Center featured music, art and community! Dancing to the sounds of live bands; Country-Western, Celtic, Folk, Latin, Marimba are just a few of the sounds heard. Art exhibits from First Night-sponsored workshops from Greenfield to Salinas and Marina were on view, and First Nighters posted their hopes and dreams for the New Year on our Resolution Sculpture.